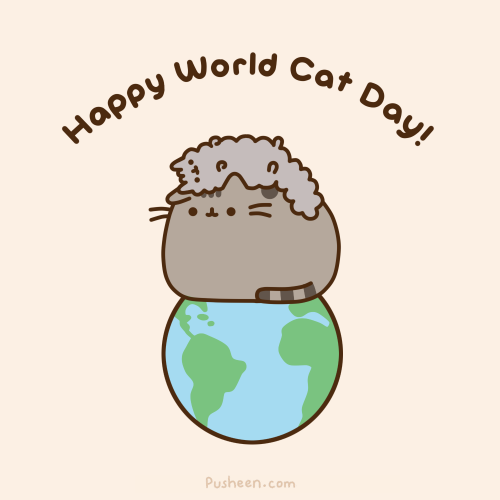 CAT FRIDAY: It's World Cat Day! International, or World, Cat Day was first celebrated in 2002, and was organized by the International Fund for Animal Welfare. In celebration of this momentous date, we think it's appropriate to look back and share some of our best, most popular and "awww"-worthy Cat Friday features from the past couple years. Happy World Cat Day! Pusheen is one of our favorite cat characters. 2.) More recently we've attempted to focus on sharing the needs and news of local animal welfare groups and shelters, and stories of people who devote their time to helping homeless cats. We've featured reasons people foster kittens from local shelters, what to do if you find a litter of homeless kittens and their mother, and profiled long-time shelter cats looking for homes. 3.) During a couple trips outside of the Inland Northwest, I visited and profiled the kitty habitats at shelters in Portland, Oregon, and Austin, Texas. 4.) We once ventured away from typical Cat Friday coverage on domestic cat issues to feature some of the world's most adorable wild cats. 5.) One of our favorite occasional series has been profiling local business cats — as in cats who hang out or call home a local business. Meet the cats of Spokane Vintage Warehouse, Design Spike and Interiors by Robin. 6.) Cat Friday reported on Washington's rank as the 5th state in the U.S. for cat ownership. 7.) If it weren't for Alice joining my family, Cat Friday probably wouldn't exist, so I shared her story in this post on her 10th birthday. 8.) Cat lovers felt a huge loss earlier this year with passing of the late, great Colonel Meow, a Washington-state native, whom I was incredibly fortunate to interview back in 2012. 9.) Just as often as we've shared stories of famous kitties, we've devoted lots of space on the blog to feature dear little cats who've overcome incredible odds and tragedies: Panda, Anakin and other biped cats, Baby Bug and Mercury and Frosty. 10.) A favorite for its amazing local tie was an opportunity earlier this year to meet and interview Charlie Schmidt, the Spokane artist credited with creating the first original viral cat video and subsequent meme: Keyboard Cat.